The New York Bank Hoard. Coins That Never Were. National Wildlife Week Sale! 2019 Apollo 11 50th Anniversary Commemorative Silver Dollar Coin NGC MS70 ER Moon Core Holder SKU56531. 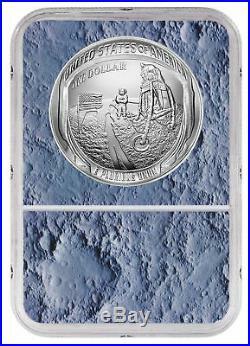 This spectacular domed silver dollar is issued by the U. Mint to commemorate the 50th Anniversary of NASA’s Apollo 11 space mission and mankind’s first lunar landing. The 1.500 inch diameter coin is struck from 0.8594 Troy oz. 999 fine silver, its mintage limited to 400,000. 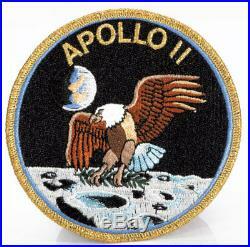 An astronaut’s footprint is depicted embedded in the lunar surface on the concave obverse. “MERCURY, ” “GEMINI” and “APOLLO” curve above, divided by phases of the moon. Additional inscriptions include “2019, ” “IN GOD WE TRUST” and LIBERTY. The design by Gary Cooper was sculpted by Joseph Menna. The domed reverse is shaped to represent Buzz Aldrin’s helmet, adorned with the reflections of Neil Armstrong, the U. Flag, the lunar lander and the astronaut’s shadow. Designed and sculpted by Phebe Hemphill, the image includes the inscriptions “UNITED STATES OF AMERICA, ” “ONE DOLLAR” and E PLURIBUS UNUM. Impeccably Struck Early Releases Mint State 70 with Moon Core Holder. This 2019 Apollo 11 50th Anniversary Commemorative Silver Dollar Coin is graded a perfect Mint State 70 by Numismatic Guaranty Corporation (NGC). 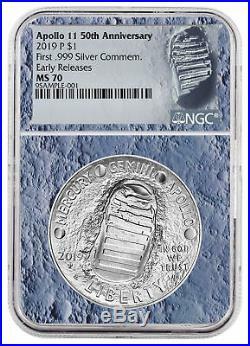 The uniquely shaped coin is enclosed in a NGC protective holder surrounded by a moon themed core, accompanied by a certification label designating the coin as Early Releases for submission to the grading service within the first thirty days of its release date. Make this perfectly struck celebration of the 50th Anniversary of the historic Apollo 11 mission the next treasured addition to your collection! Specifications for this 2019 Apollo 11 50th Anniversary Commemorative Silver Dollar Coin NGC MS70 ER Moon Core Holder SKU56531. We cannot make any price adjustments after the sale is complete. Product Photo Policy: MCM attempts to display product images shown on the site as accurately as possible. We take all of our photos in house and due to reflections on the mirrored or proof surfaces of a coin there may appear to be’black’ when there is not. If a coin has a color on it at all it will be described as’colorized’ in the description or title. Due to the large inventory we sell, we use stock photos. Serial numbers will vary from the image shown unless specifically stated in the product listing that the item pictured is the item you will receive. INTERNATIONAL ORDERS POLICY: We are accepting international orders from select countries. These charges are the customer’s responsibility. However, we cannot guarantee this due to the volume of orders we process each day. Beyond the 30-day return period, Company is under no obligation to accept return of any product, but may in its discretion do so pursuant to this policy, for up to one year from the invoice date. ModernCoinMart (MCM) was launched in 2004 and quickly set the standards for online sales of bullion, US coins and world coins. Join over 100,000 loyal customers and feel confident purchasing from a company that’s spent a decade building a solid and stellar reputation trusted and recognized around the world. That’s the MCM way. View more great items. This listing is currently undergoing maintenance, we apologise for any inconvenience caused. The item “2019 Apollo 11 50th Commem Silver Dollar NGC MS70 ER Moon Core SKU56531″ is in sale since Thursday, January 24, 2019. This item is in the category “Coins & Paper Money\Coins\ US\Commemorative\Modern Silver/Clad (1982-Now)”. The seller is “mcm” and is located in Sarasota, Florida. This item can be shipped worldwide. This entry was posted in apollo and tagged 50th, apollo, commem, core, dollar, moon, ms70, silver, sku56531 on April 8, 2019 by admin.